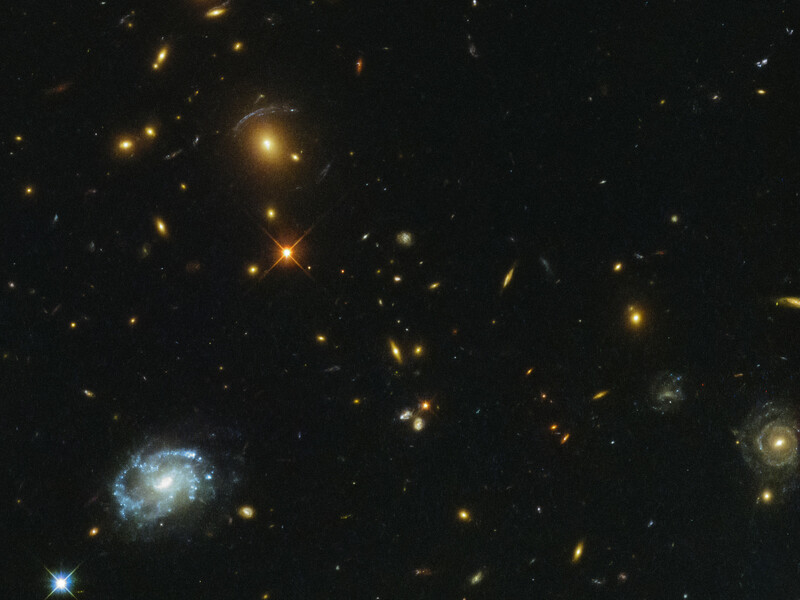 Though the bright, light-speckled foreground galaxy on the left is eye-catching, it is far from the most intriguing object in this NASA/ESA Hubble Space Telescope image. 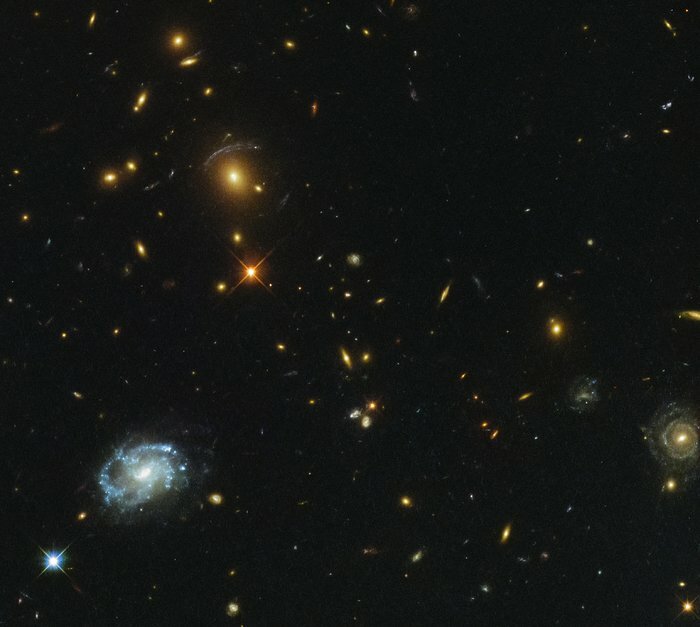 In the upper part of the frame, the light from distant galaxies has been smeared and twisted into odd shapes, arcs, and streaks. This phenomenon indicates the presence of a giant galaxy cluster, which is bending the light coming from the galaxies behind it with its monstrous gravitational influence. This cluster, called SDSSJ0150+2725, lies some three billion light-years away and was first documented by the Sloan Digital Sky Survey (SDSS), hence its name. The SDSS uses a 2.5-metre optical telescope located at the Apache Point Observatory in New Mexico to observe millions of objects and create detailed 3D maps of the Universe. 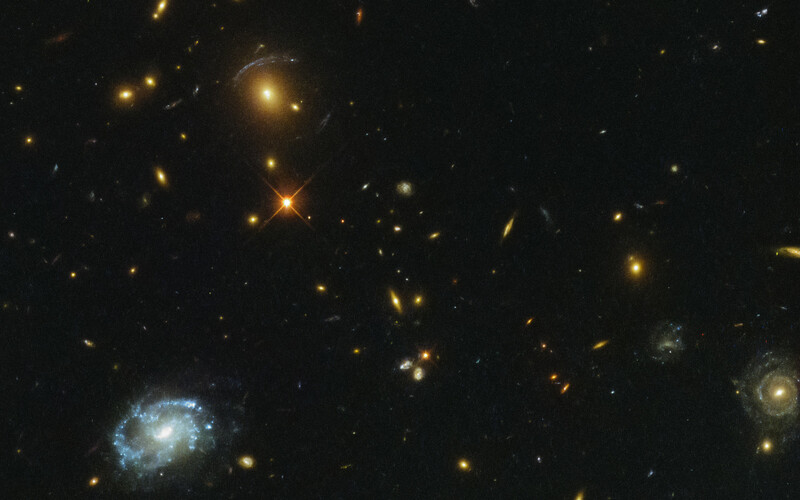 This particular cluster was part of the Sloan Giant Arcs Survey (SGAS), which detected galaxy clusters with strong lensing properties; their gravity stretches and warps the light of more distant galaxies sitting behind them, creating weird and spectacular arcs such as those seen here. 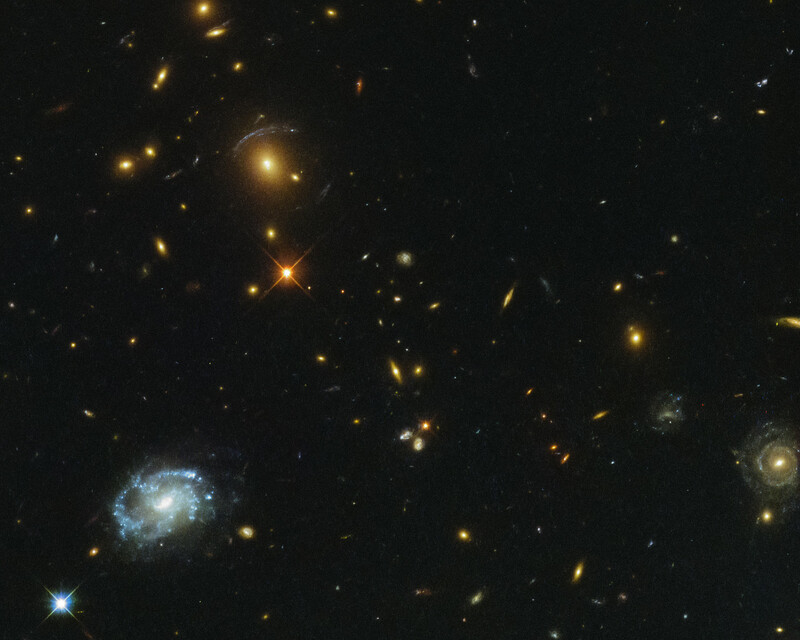 The Hubble data on of SDSSJ0150+2725 were part of a study of star formation in brightest cluster galaxies (called BCGs), lying between approximately 2 and 6 billion light-years away. This study found the star formation rate in these galaxies to be low, which is consistent with models that suggest that most stars in such galaxies form very early on. These BCGs also emit strong radio signals thought to be from active galactic nuclei (AGN) at their centers, suggesting that the activity from both the AGN and any ongoing star formation is fuelled by cold gas found within the host galaxies. Position (Dec): 27° 26' 3.99"